From the volleyball manga series with two anime seasons, ‘Haikyu! 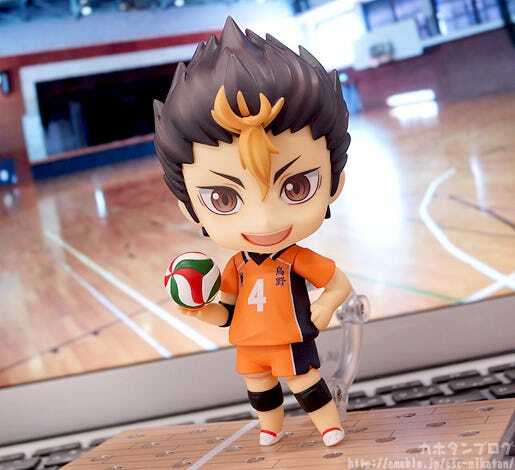 !’ comes a Nendoroid of the Karasuno High School volleyball clubs’ libero known as “Karasuno’s Guardian Deity” – Yu Nishinoya! He comes with three different expressions including a cheerful smile, a serious expression to display him concentrating on the match as well as a carefree grinning expression. 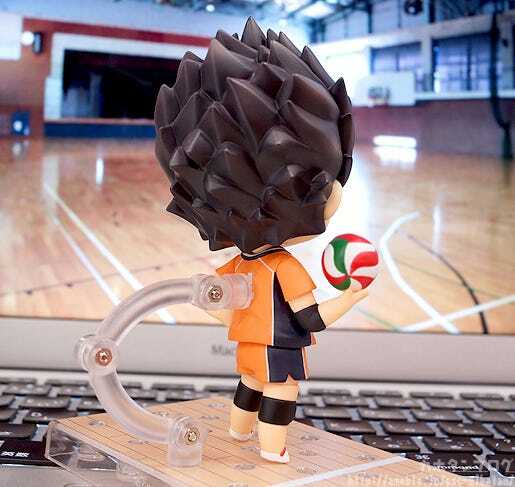 The Nendoroid is able to take various receiving poses and also comes with a volleyball and special base made in the image of a volleyball court. A sports towel and as well as alternate hair parts with his hair down are also included! 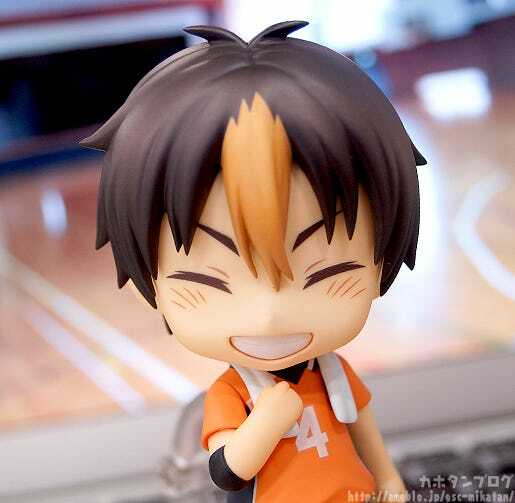 Enjoy the reliable ‘Noya-san’ in your collection! Even from the back his hair is nice and pointy! The first thing I wanted to do was display him together with his senpai!! 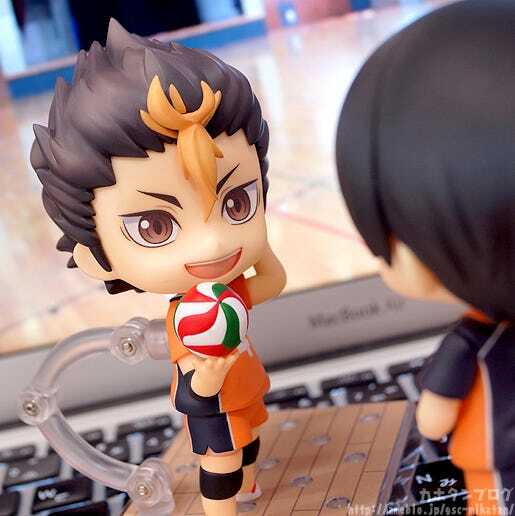 Even as Nendoroids their heights have been considered making Noya-san slightly shorter, which kind of makes it look like he is looking up to Kageyama!! 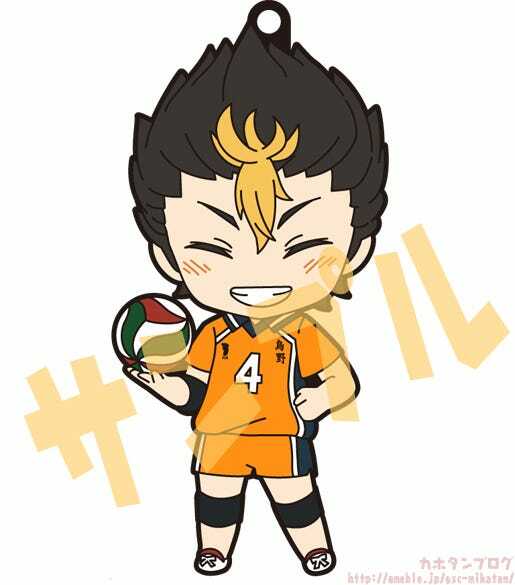 Noya-san is planned to be about the same size as Hinata! An expression with his tongue out to one side in concentration as he looks ahead for the incoming ball!! 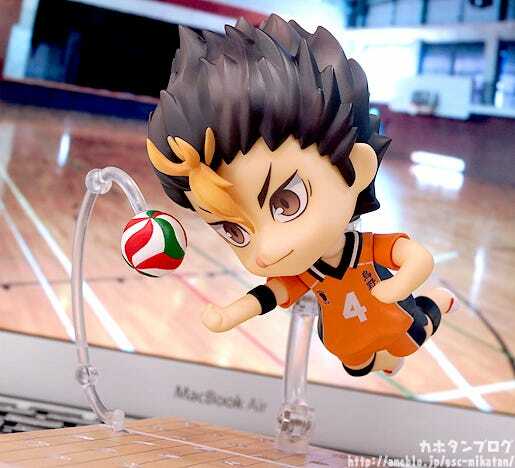 You can even make good use of the stand to pose him diving for the ball like so!! I love the main storyline of them working as a team against the other schools, but the episodes that focus on each character as they build into a team… those episodes at the very beginning have always been my favorite!! 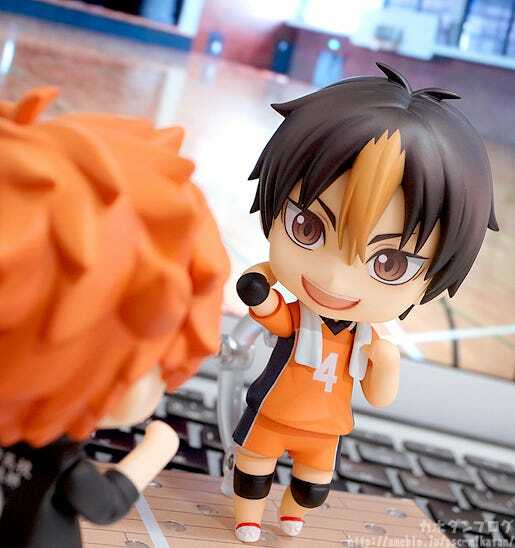 After playing this Nendoroid I feel like rewatching the anime and rereading the manga… again! On the 16th December 2015 the Blu-ray & DVD of the Movie’s 2nd Part is going on sale, so perhaps I’ll finish off the year with a rewatch of the movie! Alternate parts to display his hair down! I never thought this rare sight would make it into the Nendoroid!! 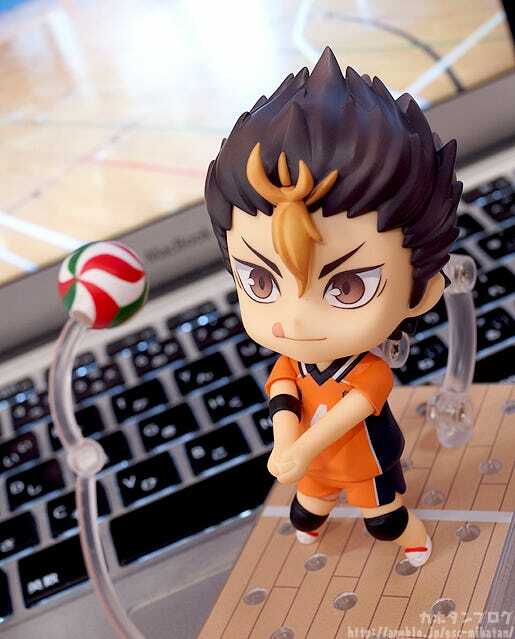 Add “Karasuno’s Guardian Deity” to your collection! 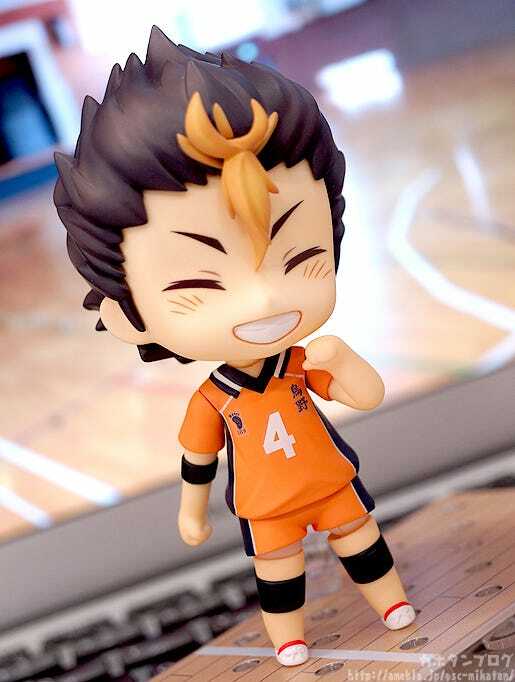 Plus orders from the GOODSMILE ONLINE SHOP will include a Nendoroid Plus Rubber Strap: Yu Nishinoya Guardian of the Smile Ver. as a bonus! △ Will be shipped out together with your Nendoroid! For English Updates Follow @gsc_kevin!